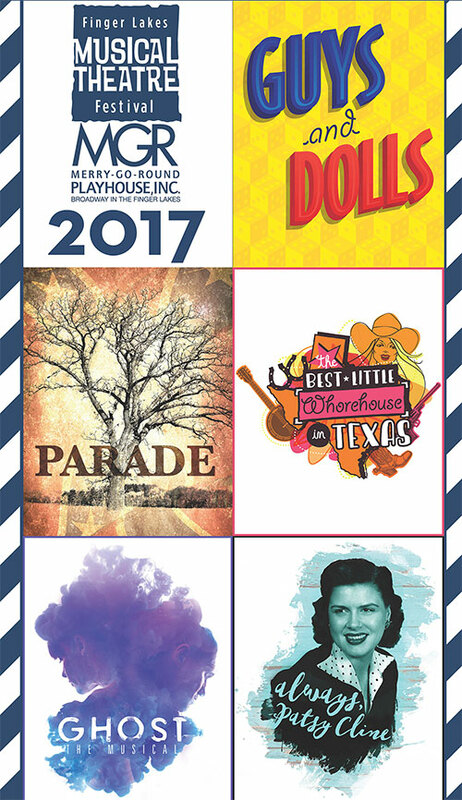 The Finger Lakes Musical Theatre Festival / Merry-Go-Round Playhouse, Inc. announced their 2017 lineup Saturday, August 27 at their annual Festival Fundraiser. The 2017 season launches June 7 with the timeless blockbuster musical comedy, “Guys and Dolls.” After 22 years since its last turn on the Playhouse stage, this megahit will launch the season with its famous songbook and rousing choreography. Opening July 5 in the second slot is “Parade.” Set in Atlanta in 1913, “Parade” is the fascinating true story of Leo Frank, a Jewish-American factory superintendent and his loving wife, Lucille. Winner of two Tony Awards and six Drama Desk Awards, this compelling musical focuses on compassionate forgiveness, heartfelt devotion and the pursuit of innocence. For adult audiences. Third in line is the high energy song and dance comedy, “The Best Little Whorehouse in Texas,” running August 2 -23. The Tony Award-winning show opened on Broadway in 1978 with Auburn’s Thommie Walsh as its associate choreographer and was later adapted into a 1982 Golden Globe Award-winning film starring Burt Reynolds and Dolly Parton. The show was last seen on the Playhouse stage 30 years ago. The fourth show of the season is “Ghost,” a musical adaptation of one of the film industry’s biggest hits which starred Patrick Swayze, Demi Moore, and Whoopi Goldberg in 1990. This funny, suspenseful and romantic musical love story opens at the Festival on August 30 – a great time for the whole family. Finishing the season September 21 through October 7 is the ever-popular, “Always, Patsy Cline” which brings over 30 of Patsy’s famous hits including “Walkin’ After Midnight” and “Crazy” to the Playhouse stage. This inspiring, funny story is a must see for all audiences. The new works series, “The PiTCH,” now in its sixth year at the Festival, will once again invite audience members each week to witness and give feedback to new musicals in development from July 12 to August 11. To date, the Festival has given residence to 54 emerging new musicals. Subscriptions are on sale now. The discounted Blue Light Special price is available until Oct. 19, 2016. Subscriptions can only be purchased over the phone (1-800-457-8897), in person, or by mailing in a completed subscription form. Flex Pass and Gift Certificate sales begin in late October and single ticket purchases can be made starting February 2017. Four hours from New York City and situated between Syracuse, Rochester and Ithaca, the Finger Lakes Musical Theatre Festival is the largest producing musical theatre organization in New York state, outside of New York City. The Festival is headquartered in the town of Auburn, NY – set in the picturesque Finger Lakes wine region of Central New York – and operates on multiple stages. Named NY Theatre Guide’s “Best Professional Theatre, 2015,” it has provided over forty years of top-notch entertainment to over 68,000 patrons each season and is routinely recognized by industry press for its artistry and execution.